Title: 'Cypri insulae nova descript'. Verso text is Italian. 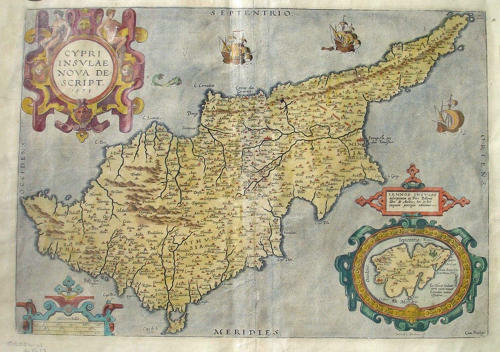 A milestone in the history of cartography of Cyprus based on a 1570 map by Giacomo Franco. The map is embellished by sailing ships and a sea monster, bearing a map of Lemnos in an inset bottom right based on the written account by Pierre Belon 1555. At top left the title is framed in a cartouche.